Let's first start with Sample Society. It's $15 monthly, and you get 4-5 deluxe sample sized beauty products from prestigious brands sent to your home once a month. It's created by Allure Magazine and BeautyBar.com and includes a monthly $15 off code toward a Beauty Bar purchase of $50 or more, but must include a purchase of one of the brands feature in your box for that month. younger, firmer, healthier skin. Feels fabulous on my skin at night! Retails at $72 for the full size, this perfume is very girly and has a strong floral scent that will be nice for Spring. A light mist was enough for me to enjoy the scent all day without it being over powering headacheville. For dry chapped cuticles. PERFECT for Winter! This instantly moisturized my cuticles and nail beds and Im obsessed with the smell! I secretly use it on my dry knuckles. Shh! This retails at $75 for the full size, plumps the lips,treats lines and wrinkles, and hydrates. Haven't tried this yet but it sounds quite interesting. This retails at $22 for the full size version. 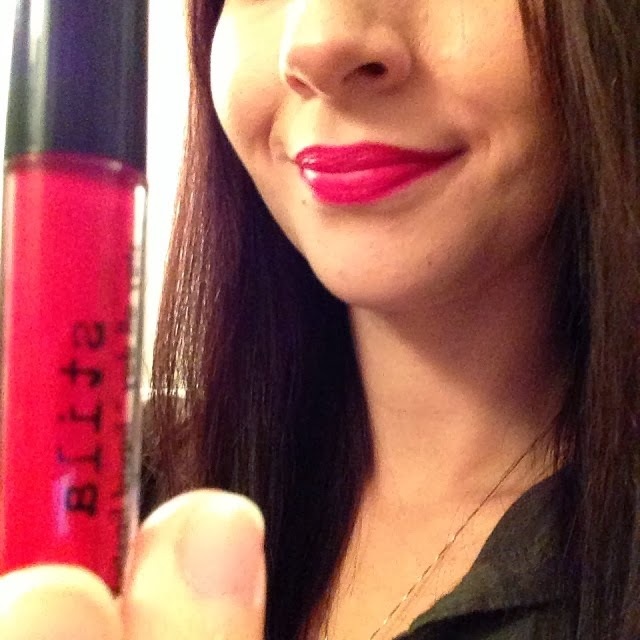 I LOVE Stila products and this is the first Stay All Day Liquid Lipstick that I've ever tried. It's Fabulous! By far the star of the box for me. It is a super thick opaque formula that dries matte so be light handed and careful when applying. It's an intense bold red that's quite pretty! Perfect for Valentines Day! This lip balm is incredibly moisturizing and I love the mojito scent/flavor. It's been my go to all week, I can't get enough! This is my first Proactiv product and it came just in time because I've been having a few pesky breakouts lately that keep popping up. I was unsure of exactly what these were for so I looked it up on the Ipsy site. They're no rinse peel pads that remove any dead skin cells on skin's surface for radiance and help fade dark acne scars. In one use they helped to heal my blemishes, probably due to the 2% Salicylic acid. I'll save the remaining 3 pads for when Im feeling breakouts coming on. No need to afraid of peels people! Just be well informed of your skin type and if it's the proper peel for your skin. I am a big fan of this brand, as I have liked all of their hair products that I've tried with this being no exception. Smells great, leaves my hair soft, less tangled and more manageable. Sample Society that I am trying to make my way through. It's supposedly stimulates collagen production and whitens, so sounds like what you want in an eye cream. Will update when I try it. Overall, the cuticle oil and lipstick were my faves in the Sample Society box and the Lip balm, Leave in Conditioner and Shadow were the faves from my Ipsy bag. It's really a tough choice as to which sub was better this month as there's not one that completely dominated but I guess I'll have to give it to Ipsy since there was one more fave product in their bag than in Sample Society box, and it's $5 less a month so it was a better value. Noticing a pattern? I am really considering canceling my Sample Society, not because I haven't enjoyed their service but I am accumulating way too many skin care samples than I can keep up with. I think I enjoy a more makeup geared sub like Ipsy. Maybe I'll try GlossyBox or Birch Box? I've heard good things about the stila lip color. That shade looks really nice on you! And I agree with you, it seems like ipsy has been better every month. Thanks for comparing these each month! It's really helpful to see these compared side by side! Hi Alice! Thanks for reading! I have followed your blog via Bloglovin and would love to help you if you ever need it. Come back tomorrow and add your blog url to my Beauty Blog Hop to network with other amazing bloggers. Thanks! These sample sites are brilliant! Wish they offered samples in Europe! We are two new beauty bloggers trying to open the doors to beauty followers in Europe as well as the US. We are both living in Croatia and our blog is dedicated to giving advice to girls who are fashionistas living in this limited beauty market country. You blog is very inspiring and interesting! Hope you will follow us! Thanks!